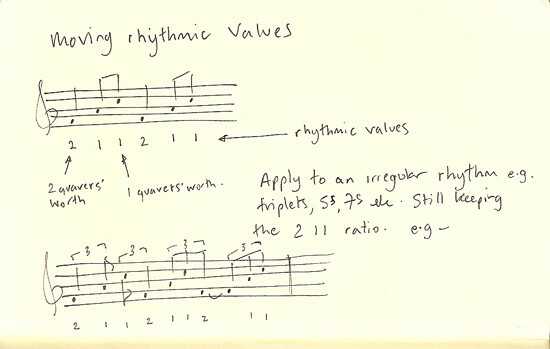 This is a sort of rhythmic transposition that uses the relational values between rhythmic events which are then shifted to another rhythmic framework. If you heard both of these examples without reference to a pulse, then they would both sound the same. Apply the same thing to groups of 5s. Or take a really common riff that’s burned into your mind as being that way and no other, the riff to Whole Lotta Love, for instance. And then figure out the relational values and shift it into a triplet framework. Learn it. Make some cheese on toast. Add snorkeling equipment. No yer talkin’, baby. Just as a little aside for the more mathmatically inclined readers: can you have a ratio with three things? Is that even possible? Or are ratios always between two things?